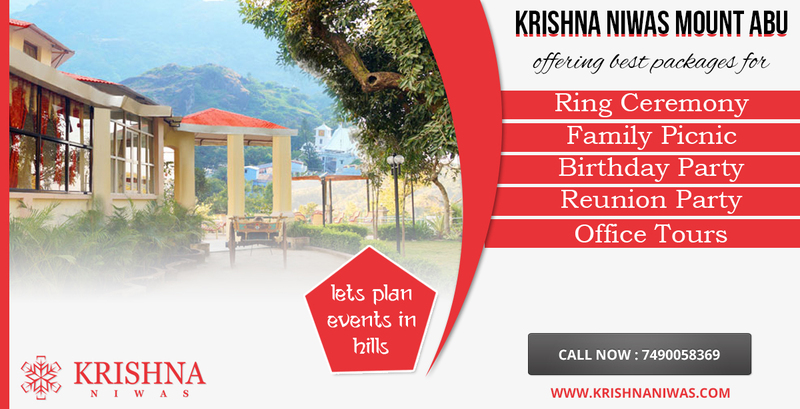 Planning any family function in Mount Abu?? or hosting a birthday or anniversary party in Mount Abu and confused about the venue??? Hotel Krishna Niwas the Heritage House is the perfect place you can suggest to anyone. It is a heritage property more than half a century old(since 1924), but renovated and maintained with all the necessary amenities on hand for their guests’ comforts and needs. This hotel is the perfect venue for birthday party in Mount Abu. Either it is an anniversary party in Mount Abu or a birthday party celebration in Mount Abu, Hotel Krishna Niwas is one of the best birthday party organisers in Mount Abu. This hotel has excellent accommodation options available for their guests categorized in three main categories, Deluxe rooms, Super Deluxe rooms, and Family suits. Each and every room is designed in its own style with ethnic interior and infrastructure. They have their own standards of lavishness and comfort, which is nearly impossible to achieve for any other hotels in town. Krishna Niwas has everything starting from modern outlook and opulent experience. Staying here will definitely give you an outstanding experience in Mount Abu. This property is an amazing option for a relaxing and lavishing experience in a heritage style luxury resort in Mount Abu. The wide varieties of ultra luxurious amenities are available for visitors including family, friends, and couples to enjoy the unparalleled beauty of Indian colonial style architecture and royalty. You will feel like a home away from home with the warm amenities, ambience and homely taste food made in the hotel’s own restaurant. Because they have tried hard to meet the hospitality standard, keeping the heritage intact, making it one of the top heritage hotel in Mount Abu. They also arrange ring ceremony functions in Mount Abu as well as engagement party in Mount Abu. In all these functions, they take care of everything starting from welcoming the guests, taking care of all their needs, catering services. They have a beautiful garden area where they arrange all these functions. They also have beautifully designed and furnished rooms, so even if you are not a localite in Mount Abu and want to go for destination function celebration with your family and friends, this place is the best option for you. So, don’t miss the chance. Enquire now only at Hotel Krishna Niwas the Heritage House, and make your function happening and successful.